A Highland Perthshire chocolate maker has seen its internet speeds rocket from 6Mbps to 60Mbps thanks to the £428m Digital Scotland Superfast Broadband programme. 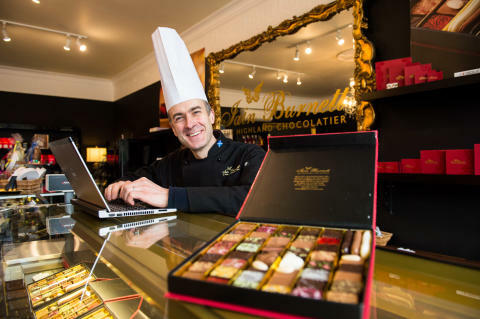 Iain Burnett, The Highland Chocolatier based in Grandtully, Pitlochry, is among hundreds of businesses across Perth and Kinross to benefit from fibre broadband, using its new high-speed connection to showcase confectionary online and boost customer service. More than 1,900 households and businesses across Pitlochry – among around 37,700 across Perth and Kinross – are now able to order fibre broadband through the Digital Scotland roll-out, which has also reached places like Little Dunkeld, Inchmichael, Kinrossie, Comrie and Muthill. Iain explains: “Before fibre broadband our internet was frequently slow and the speed rarely got above 6Mbps. This meant that we could not offer our visitors Wi-Fi access as it would affect the functionality of our business internet services. The programme announced last month that more than 95 per cent of homes and businesses across Scotland can now access fibre broadband. Combined with commercial coverage, the DSSB programme exceeded its target of 95 per cent on schedule. More local coverage will follow as engineers from Openreach, Scotland’s digital network business, continue work on the ground. As fibre broadband offers fast and reliable broadband connections at speeds of up to 80Mbps1 - and there are many suppliers in the marketplace to choose from - businesses can see an improvement in communication as it allows for a smoother and faster approach. The shop is dependent on its website to showcase its award-winning chocolates, particularly to retain online customers. Upgrading to fibre broadband means the team can upload large files and images quickly and easily. Robert Thorburn, Openreach fibre partnership director for Scotland, said: “Thousands of people and businesses across Perth and Kinross now have the opportunity to access their best-ever broadband speeds when they sign up with a service provider.